Die-hard off roaders and urban city slickers alike will enjoy the new release of SA Streetmaps Topographical and Recreation version from Garmap. For the uninitiated, Garmap's software is designed for managing track, route and way-point information on a Garmin-based GPS and also provides accurate map data on a CD-ROM, which can be used on a PC or loaded on the GPS itself. The era of convergence between the serious 4 X 4 trailblazer and the off-road pavement pioneer is fast approaching with the introduction of recreational planning equipment such as the South African Topographical and Recreational software. 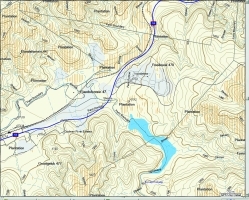 The South African Topographical and Recreational (SA Topo & Rec product, as it is referred to by those in the know) integrates with other detailed map bases such as SA Streetmaps and seamlessly overlays this information over a topographical tier providing a comprehensive SA map base for recreational planning and orientation in a specific area. MapIT provides the most extensive road coverage in South Africa and with technical partners, Georigin, have gained access to all Surveyor General's maps whilst developing this product. If you tried this, you would be carrying home over 2000 maps. The visual and audio medium on your GPS unit allows this mapping tool to help plan your trip by using the SA Streetmaps software to get your specific location and the SA Topo & Rec info to guide you through a specific area of interest. Due to the size of the data on the SA Topo & Rec product, it is advised that this product be used in combination with the current SA Streetmaps V3 or Africa Road Atlas from MapIT. SA Topo & Rec is non-auto routable but has got search capabilities on specific features. This CD contains 1:50 000 topographic data for South Africa, Swaziland and Lesotho, with the GRID reference system based on the current 1:50 000 maps. All roads as provided by SA's benchmark digital mapping company, MapIT, are provided and are combined with additional road data provided by the Department of Surveys and Mapping. Supplementary access thoroughfares such as farm roads, small town streets, hiking trails and gravel tracks have also been included. 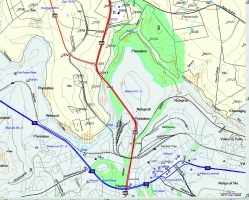 As SA Topo & Rec is not a routable product only road names and numbers of highways, main roads and through-routes have been included and made searchable. Similar to the 1:50 000 Streetmaps version, street names have been omitted. SA Topo & Rec also provides topographical contours; trigonometry beacons; rivers; farm and farm portion boundaries; the boundaries and known names of every city, town and settlement in South Africa is included and searchable; parks and reserves; 4 x 4 trails; and complete railway info of South Africa is provided. Areas of natural forests, woodlands and plantations within South Africa, Lesotho and Swaziland are shown and a myriad of Places of Interest (POIs) such as lodges, hotels, service stations and historical sites are included.